Euthanasia Prevention Coalition Euthanasia Prevention Coalition: Oregon assisted suicide lobby wants to expand the assisted suicide law. 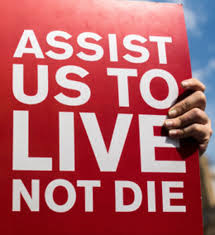 Oregon assisted suicide lobby wants to expand the assisted suicide law. I have always said that the Oregon assisted suicide law was designed to extend suicide by physicians to other states. The assisted suicide lobby controlled the law and maintained the lie that there were no problems with the law. I knew that eventually they would decided to expand the provisions of the law. Recently, the leader of C & C, formerly the Hemlock Society, outlined their commitment to eliminate provisions in the assisted suicide laws. Brittany's Bill is a new bill that will be introduced in the 2019 Oregon Legislative Session. It's purpose is to expand the current Death with Dignity Law. The end result will be to change the eligibility of people who can take advantage of this choice. Currently, only patients diagnosed with a terminal illness and a life expectancy of six months are eligible. Brittany's Bill will expand the eligibility to any patient with an incurable disease or experiencing unbearable pain. In the upcoming 2019 Oregon Legislative session there will be bills, including one called Brittany’s Bill, introduced in both the Senate and House health committees to expand Oregonians’ end-of-life choices. Expansive assisted suicide bills that lack clear definitions are the new normal. For instance that New Mexico assisted suicide bill is the most radical bill that I have ever seen. A new era in the assisted suicide debate in America has begun.